On Saturday I was in DC for a baseball game. Post-season baseball. The National League Divisional Series. The Nationals versus the Giants. It was not my first live experience with post-season baseball. Last year I attended a playoff game between the Harrisburg Senators and the Erie SeaWolves, and then a few days later I attended the final game of the Eastern League Championship Series between the Senators and the Trenton Thunder. But this was to be my first — and thus far only — experience with major league post-season baseball. When I received an e-mail from the Washington Nationals in mid-September, shortly after the team clinched the National League East and a post-season birth, about post-season tickets for the National League Division Series, I didn’t give it a lot of thought. “No, I’m not going. I can’t go.” Then an e-mail about the presale arrived, I clicked through and saw the pricing tiers and likely schedules based on seeding, and my mind changed. Tickets weren’t that unreasonable. And the most convenient game would’ve been Game 2, as it would’ve fallen on a Saturday if the Nationals were the first or second seed. (If they were third seed, Game 2 would’ve been on Tuesday the 7th, but that would have required a post-clinch inability to win.) Why not? If I tried for a ticket, the worst that could happen would be that I wouldn’t get one. The appointed presale day arrived. A reminder e-mail dropped in my inbox. I clicked on the link and waited in the virtual waiting room. By five minutes past ten o’clock, I had a ticket for game 2 of the NLDS — date unknown, time unknown, opponent unknown. And it was, after fees and such, only about ten dollars more than I spent on a similar ticket (same section, no less!) for the fourth of July game. I saw on Twitter later that morning that people had difficulty getting tickets. On a Nationals podcast I listen to, a few days after the presale, one of the hosts went off on a five minute rant about his inability to secure tickets for the NLDS. However, I didn’t have a lot of sympathy for him. He said that he kept “refreshing” his browser. Every time he did that, he moved himself back to the end of the line in the virtual waiting room. You have to ride out the virtual waiting room and hold back the urge to click refresh. Eventually, the seedings sorted themselves out — the Nationals ended the season with the National League’s best record and earned the top seed — and the opponent sorted itself out — the San Francisco Giants, winners of the Wild Card play-in game — and the time was set — 5:37. And gates opened at 3 o’clock, so I decided I would spend the day in DC playing tourist before the game. I had no real plan for the day. I got off the Metro at the Navy Archives, walked to the National Mall, and decided to do whatever the spirit moved me to do. I went to the National Gallery of Art which, in recent years, has become my favorite of the Smithsonian museums. Afterwards, I walked up Pennsylvania Avenue in the direction of the White House. A “save the elephants” rally in Lafayette Park outside the White House! 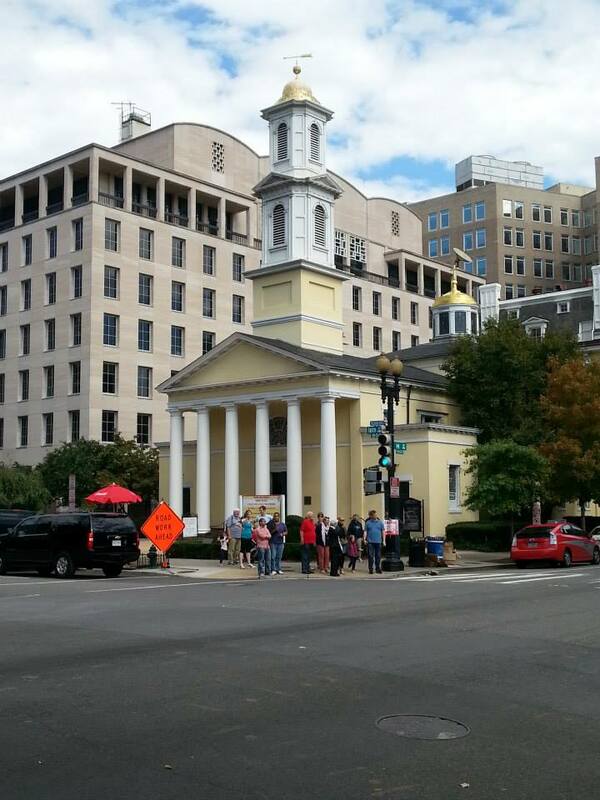 St. John’s Episcopal, the “Church of the Presidents”! The White House! From the other side! I made my way down to Nationals Park, arriving there shortly before the gates opened. I wasn’t the only one who wanted to be there early. There was a nice crowd heading out of the Navy Yards Metro station and congregating along Half Street. It was a party-like atmosphere outside the centerfield gate. There was a drum band playing Nationals fight songs, people walking around on stilts, and a lot of energy. And when the gates opened at three, the lines moved quickly through security and the turnstiles, and once inside they handed each of us a white rally towel emblazoned with a red Curly W, provided by Geico. …and by the time I reached my seat (since I walked the concourse and loitered in the team stores before I got there), Giants batting practice. A lot of people were wearing red, since red and white are the Nationals’ primary colors. (They have an alternate blue jersey, which, to be honest, is my favorite Nationals look.) I was wearing blue, specifically a Harrisburg Senators t-shirt (since the Senators are the Nationals’ AA affiliate) and a Nationals hat. Before the game began, the Nationals showed a couple of videos on the video board. One was the Nationals “intro” movie, a stirring piece of work that surveys the monuments and the city’s baseball history. The other I called “Baseball Is.” It’s new, I think (I don’t remember it from the fourth of July, and some of its footage was recent), and it’s about what baseball is and what it means. It was lyrical and moving. I’m not ashamed to say that I shed a few tears at the end. The Nationals entered the game down 1-0 in the National League Division Series, a best of five affair. In Friday’s game, Stephen Strasburg started, pitched well but gave up two runs, Craig Stammen gave up a third, and while the Nationals offense, specifically Bryce Harper and Asdrubel Cabrera, hit home runs late in the game, they didn’t close the gap and dropped the first game of the series 3-2. In game two, Jordan Zimmermann, fresh from his no-hitter on Sunday, was matching up with the Giant’s Tim Hudson. It was a tight pitching match-up. Zimmermann gave up a hit here, Hudson gave up a hit there. In the third inning, the Nationals were able to scratch a run across, and the score stayed 1-0 through the fourth, the fifth, the sixth. One thing that helped to keep the game close was the moderate gale that was blowing through the park. It had been warm during the daylight hours (and I seem to be mildly sunburned, with tanlines around the neck, on the arm, and at the ankles), but after the sun went down the temperate dropped and the wind made a pleasant October evening feel downright cold. There was a team store right behind my section, and I ran out to buy a hoodie; I needed it because my Senators t-shirt wasn’t keeping the cold at bay. Much as I enjoy watching the Nationals and rooting for them, there’s one thing about the Nationals Park experience that I’m not really high on — the rampant jingoism. The flag was presented by the Air Force Color Guard. The ceremonial first pitch was thrown out by a wounded Iraq War vet. (I’m not criticizing him; he was awesome. He was having the time of his life and loved every minute of it.) The commandant of the Marine Corps presented the umpires with the “official game ball.” There was a salute to the armed forces around the fifth inning. D.C. Washington (yes, his real name) peformed “The Star-Spangled Banner” and, in the seventh inning stretch, “God Bless America.” (Like at the fourth of July, I declined to stand or particpate in the song.) I get it — nation’s capital, salute the troops every chance we get — but it gets to be a bit much. Zimmermann completed the top of the eighth, and the Nationals threatened to add an insurance run in the bottom of the inning, but nothing came of it. To the bottom of the ninth. The Nationals again threatened, but the threat was defused. To extra innings! Nationals’ second baseman Asdrubel Cabrera was tossed by the umpire on a called third strike argument, then manager Matt Williams was tossed. I thought that Williams might’ve gotten himself tossed for the reason Lou Pinella used to, to fire up his team; they hadn’t managed any offense worth noting since the third inning, and an argument might light a fire under them. Then things took a strange turn — there were umpire meetings, the Giants manager came out to talk, the home plate umpire appeared to warn the Nationals bench, and the crowd was raining boos down on the umps. It was a bit ugly. By this point, about 9 o’clock, the crowd started to thin out. It wasn’t noticeable at first, but eventually, by ten o’clock, around the 13th inning, there were sections that were severely depopulated. I’m not going to criticize anyone who left. I’ll be honest, there came a point where I gave serious consideration to leaving with the outcome in doubt; I had a long trip back to Pennsylvania. It was cold in the stands with the gale blowing through. Food service ended around the eighth inning. There were families there with children (including one family near me with a daughter who had made an “In Werth We Trust” sign that she liked to hold up at the railing overlooking the field between innings — and Jayson Werth saw the sign and threw her a ball between innings). No one plans on spending five hours or more at a ballpark, and certainly not with the chilly conditions. I’ve seen criticisms in the media — fans should have dressed more warmly, fans shouldn’t leave a playoff game, fans are letting the team down by leaving early — and I don’t agree with any of them. People had their reasons for leaving, and I have no doubt that every one was legitimate for the person, especially once the game went past ten o’clock. It takes patience, endurance, and energy to get through an 18-inning marathon in the best of times. Try doing it in a gale on a cold night in October. I salute the 20,000 fans who, like me, stayed to the bitter end. And I’ll also tip my hat to those who stuck it out as long as they could. Sometimes, despite your desires or best intentions, the situation gets to be too much. Both teams were basically burning through their bullpens as the game wore on. I could hardly keep track of the pitching changes. I remember thinking when Randy Knorr (bench coach for the Nationals) sent in Rafael Soriano that he was throwing in the towel since Soriano has been pretty terrible lately, but Soriano had a solid inning. Tanner Roark, the Nationals’ fifth starter this season, came on in relief in, I think, the seventeenth inning. He even had an at-bat. But in the top of the eighteenth, he gave up a home run, ending the tie that had lasted since the ninth. The Nationals made an effort at a rally in the bottom half of the inning, but it came to naught with a fly-out by Jayson Werth nearly to the warning track in center. The Giants won, 2-1. Eighteen innings. The game that had begun in sunlight at 5:37 ended just past midnight. The game tied the record for the longest post-season game in terms of innings and set the record for the longest post-season game in terms of time. I’d seen, basically, a doubleheader. I’d say I definitely got my money’s worth. My day, which began with leaving Pennsylvania at 9:30, ended when I arrived back at the apartment at 2:30. But now the Nationals are down 2-0 in a best-of-five series. Every game against the Giants is now an elimination game. Yet, I think the Nationals have it in them to come back and win the next three — two on the road in San Francisco starting tonight, the deciding game on Thursday in DC. It’s a hard road with no margin for error, but I believe they can do it. I didn’t feel as dejected and depressed as I did when the Senators lost game 3 last year. The Nationals still have outs to play. The odds are not in their favor, but they can do it. They found ways to win during their ten game winning streak, with the five walk-off wins in six games. Both games have been close affairs, the pitching has held it tight, and the Giants have been luckier at scratching runs across than the Nationals. But the Nationals have the ability to score runs, and I’ve no doubt they will.